Nearly 500 years ago, Andrea Palladio designed the Villa Rotonda. Since then, it has become the most iconic of neoclassical houses. There are four versions of the Rotonda in Great Britain. In America, Thomas Jefferson designed two unbuilt versions of the Rotonda including a competition entry for the White House, in Washington, D.C. 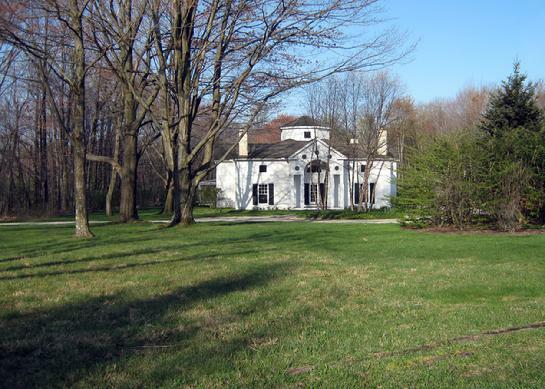 The newest American Rotonda is located in the historic district of Gates Mills, OH, which was part of the Western Reserve of Connecticut in the early 1800s. Conceptually, the nine-part bilaterally symmetrical floor plan reinterprets the plan of the Villa Rotonda in an innovative way, based on an idealized nine-square Platonic form. But the primary design challenge was to create a multi-level functional floor plan within a bold geometrical framework that would be flexible for a modern family. Traditional materials used for historic houses in Gates Mills and for the new house are very modest. These natural materials include cedar roof shingles, copper flashings, masonry chimneys, painted wood clapboard as well as tongue and groove wood siding and trim, half round gutters with full round downspouts, and operable cedar shutters. The compact, highly efficient plan of the new house maximizes floor area and minimizes exterior wall and roof area. Super-insulated walls, a low ratio of glass to wall area, as well as a geothermal system, result in an average yearly HVAC energy consumption of 10,000 BTU/SF per year. This is 50% less than the average for a new house in the U.S.